Spinal Injury is a term used to describe injury to the spinal cord. The spinal cord runs from the base of the brain to the lower back. Injury can occur anywhere along the length of the spinal column, either the neck, mid back or lower back. The most common cause is due to trauma e.g. sports injury, blunt force, but other non traumatic causes such as infection, inflammation or tumour can also affect spinal cord tissue. The extent of symptoms will depend largely on the site of injury, the type and severity of injury. Symptoms will therefore vary for each individual. Spinal cord injuries are classified into complete or incomplete. Incomplete spinal cord injury refers to the preservation of some sensation or movement below the level of injury. Complete spinal cord injury refers to complete loss of movement / sensation below the level of injury. It is importance to classifying an injury into the above categories because sparing of movement or feeling below the level of injury may provide important functional benefits to the person. Depending on the site of the lesion symptoms may include muscle weakness, altered sensation, bladder and bowel impairment. Stiffness also is known as spasticity and spasms may also be present in the limbs. The extent of the damage will depend on the level of injury to the spinal cord and will vary for each person. Injury to the neck will affect movements in the arms, trunk and lower limbs where as injury to the lower back will mainly affect the leg muscles. Physiotherapy commences when in hospital working in close liaison with other team members to optimise recovery. A Physiotherapy assessment is undertaken as early as possible following injury to evaluate baseline impairments and to plan a rehabilitation program with emphasis on regaining independence. 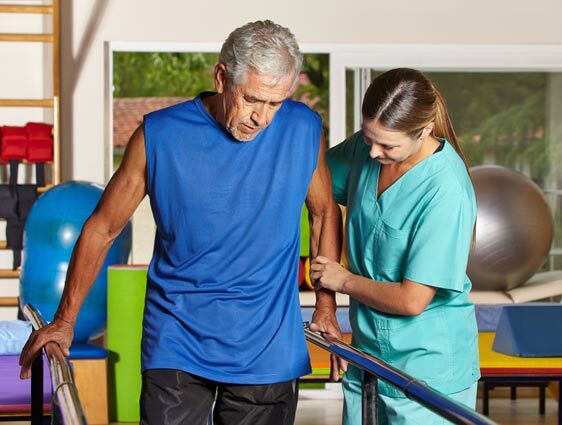 Rehabilitation may include strength training, limb movements, balance and movement re-education and gait retraining. The key aim is to help the person live as independent a life as possible and where able to resume or become involved in leisure, sporting and work activities. Physiotherapy input, in an active or advisory role, may therefore continue for a number of years after injury depending on individual needs and personal goals.